As a well-known Supplier, Exporter and Importer in the market, we are fanatical for our work and quality. We are providing Endo Air Balancer which has pendant control ergonomic up/down pendant control for variable speed cable retract brake, if the load is accidentally lost, a spring loaded centrifugal brake automatically stops the rapid upward cable travel Overload protection, the load being lifted can never exceed the unit’s maximum rated capacity at a given air pressure. It is available with the facility of dropping product at your doorsteps. Pendant Control Ergonomic Up/Down pendant control for variable speed. Cable retract brake, If the load is accidentally lost, a spring loaded centrifugal brake automatically stops the rapid upward cable travel. Overload protection, the load being lifted can never exceed the unit’s maximum rated capacity at a given air pressure. 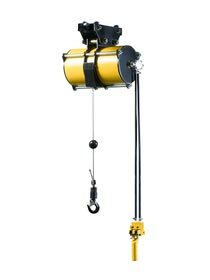 Safety, if the air supply is ever interrupted, the unit will maintain the load in the suspended position. Down stop, eliminates the down-drift of suspended loads if air supply is shut down /Hose Cut. Inertia Breaking, hoisting with Inertia Prevention unit optional.